Hockey coaching for girls and boys aged 7-13. At: ST THOMAS MORE HIGH SCHOOL, KENILWORTH GARDENS, WESTCLIFF-ON-SEA SS0 0BWEvery Monday during term time until Easter. 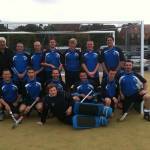 Coaches are England Hockey qualified, CRB-vetted, with First Aid certificates and insurance. Sticks and shin pads are available to borrow if required. First session is free to try!